What’s ahead in more than 20 of the state’s top industries. Georgia is on the minds of those looking to locate a business, find employment and create a life. The growth rate is holding steady; new jobs are plentiful; the state’s population is swelling with young, educated workers; and our economy promises to outpace the nation’s. This refrain is evident in economic, demographic and social research conducted by the Selig Center for Economic Growth at the University of Georgia’s Terry College of Business. The research provides an outlook for the state’s primary industries featured on the following pages. In terms of a bright economic future, the roads lead to Georgia. Despite higher mortgage rates, changes in federal tax laws that are less generous for homeowners, a shortage of skilled construction workers and limited inventories of developed lots, Georgia’s homebuilders will do very well in 2018. Home price appreciation will exceed both its long-term trend rate of growth and the rate of inflation, but the year-over-year percentage gain will be smaller than in 2017. Increases in demand will be due primarily to the improving labor market, but investors will also be active. Mortgage rates will be higher than recent years but still remain very low historically. Rents will be rising much faster than home prices or inflation, which will incentivize people to buy. First-time homebuyers will account for a slightly larger proportion of sales, which is critical because they catalyze activity in new home construction more effectively than trade-up buyers do. Spending on home renovations and repairs appears to be tracking overall activity in the housing market, because recent homebuyers spend more on home renovations and repairs than non-movers. The indicators are positive for the remodeling industry. Employment growth will give people both the confidence and the means to spend on home improvement projects. In Georgia, remodeling firms can count on retirees to spend more on home improvements. Aging-in-place projects will be an increasingly important source of growth, reflecting baby boomers’ planning for the future, living with older parents, the onset of age-related disabilities and retirees’ inability to sell their current homes on acceptable terms. Due to an improved outlook for sales, business spending for capital equipment will contribute more to state and national GDP growth in 2018. Higher spending for manufacturing equipment reflects replacement needs, growth of markets for final products, the need to increase productivity and substitution of manufacturing equipment for labor as wage and salary pressures mount. Equipment producers will benefit from cyclical increases in demand, with capacity utilization levels consistent with higher demand for industrial equipment and machine tools. Demand will increase because recent spending is too low to maintain, much less expand, the capital stock. Slightly higher raw materials prices will increase cost pressures on the machinery and manufacturing equipment industry but will also increase demand from basic commodities industries. The net effect will be very positive. Sales of new and used cars, SUVs and light trucks have reached levels that will be hard to sustain as lenders tighten credit conditions due to rising default rates and financing costs. Nonetheless, gains in disposable personal income, more jobs, more confidence, better fuel efficiency and the aging vehicle fleet will be powerful drivers of sales, so sales won’t decline much. Lower sales will hurt original equipment manufacturers, but replacement parts manufacturers will enjoy stronger markets due to the large number of older cars on the road. Auto parts and tire manufacturers will also benefit from an expected increase in miles driven. Rising transportation costs and political pressures will encourage foreign manufacturers to invest more in U.S. production facilities and buy parts from U.S. manufacturers. The several assembly plants in neighboring states will foster growth of parts manufacturers in Georgia. Accounting for about one fourth of Georgia’s manufacturing gross state product, food product manufacturing is the state’s largest manufacturing industry. The demand for food products will grow at a moderate pace in 2018. This industry will expand its presence in Georgia, both in terms of output and employment. Food processing is highly competitive, faces demanding consumers and must adjust to volatile commodity prices. Consequently, firms will have limited flexibility in pricing, and the industry’s already thin profit margins probably will not widen. Indeed, higher agricultural commodity prices could exert pressure on food processors’ margins. In addition, high-margin branded foods will lose market share to low-margin, less-profitable private labels. Georgia’s carpet industry will benefit from increases in housing activity, including renovations and appreciating home values, as well as nonresidential usage. Productivity gains and product innovation will also help textile and carpet manufacturers survive. The carpet and floor-covering industry is becoming highly automated, so employment will not grow as fast as sales. The industry’s long-term outlook is good. By investing in plants and equipment, carpet manufacturers have become excellent competitors, but state-of-the-art facilities increasingly will be built overseas. Eventually, many foreign manufacturers will be on an equal footing with those in Georgia. Competition from wood, tile and laminate floor products will also intensify. The industry has responded by developing stain-resistant and hypoallergenic carpets, as well as carpets made of recycled materials. Demand for chemical products will increase in the typical cyclical fashion, roughly tracking increases in overall industrial production. The main opportunities for chemical manufacturing will be higher use in construction, the industrial sector and for consumer use. The best prospects are for medicines, pharmaceuticals, paints, agricultural chemicals and cosmetics. Demand for photographic chemicals will decline. An abundance of shale gas has substantially lowered natural gas prices, providing U.S. manufacturers with a much-needed advantage in global markets. Despite this critical advantage in terms of lower feedstock costs, chemical production gradually will relocate to developing countries due to the relatively high costs of complying with environmental and security regulations in the U.S. Rising electricity costs will also be a headwind for this energy-intensive industry. With domestic demand growing steadily, favorable demographics and cost effectiveness enhance prospects for pharmaceutical and medical supply firms. Sales will expand relatively rapidly, but profit margins probably will narrow, partly because low-margin generic drugs sales will expand faster than sales of high-margin branded products. Pressures from the federal government and other large buyers to hold down prices will also intensify. However, the industry continues to benefit from its focus on marketing directly to the consumer. A number of new niche drugs in the development pipeline, better research and development techniques and faster FDA approval of new drugs favor the industry’s long-run prospects. The industry will also benefit from the aging of the population and the rising incidences of chronic diseases related to aging and sedentary lifestyles. Higher loan demand will support growth in banks’ profits and be vital to achieving bottom-line growth. It will offset several unfavorable developments, including the flat yield curve where there is little difference between short-term and long-term bond rates, fewer auto loans, a dearth of mortgage refinancing and fewer reserve releases. Banks also may need to cover losses in their bond portfolios should interest rates rise significantly faster than currently expected – an unlikely possibility. Unless repealed in whole or in part, regulation compliance costs also will challenge the bottom line. Short-term prospects for financial planners and stockbrokers are good. The financial planning industry’s revenues will rise faster than GDP, reflecting growth in disposable income, increased employment and the recent wealth gains realized by many high-net-worth individuals. Advisory fees will continue to benefit from increases in the value of managed assets. Increases in longevity, the increasing median age of the population and concerns about the viability of Social Security and other public and private pensions also favor stockbrokers and financial planners. The movement toward retirement plans based on defined contributions rather than defined benefits gives long-term support to the stock market and in turn financial planners and stockbrokers. Increases in sales of new and existing single-family homes will boost commissions earned by Georgia’s residential real estate brokerage firms. In addition, these firms will benefit from more active multi-unit housing markets. Additional easing of credit standards, slightly more confidence in real estate as an investment, appreciating home prices and the stronger job market will be among the factors that will bolster recovery. Georgia’s real estate industry is also well positioned to benefit from the retirement of the baby boomers – a strong demographic trend that is virtually locked in until approximately 2028. Domestic air travel will be on the upswing. More business activity, higher corporate profits and higher disposable personal income will be the primary drivers. Higher demand coupled with better control of capacity will help improve profit margins, which widened quite a bit from 2014 to 2017. This forecast assumes that fuel costs rise only moderately. Strict visa requirements, new limits on carry-on items and the strong value of the U.S. dollar do not bode well for international arrivals. The strong dollar will encourage U.S. residents to travel abroad, however. Hartsfield-Jackson Atlanta International Airport will continue to rank as the No. 1 U.S. passenger airport. Air cargo is also growing, reflecting the increasing proportion of shipments of time-sensitive products. The data bodes well for Georgia’s ports, which will outperform peers by tapping directly into overseas growth, diversifying the services that call on the ports and taking market share from other U.S. ports. Higher demand for consumer goods, along with increases in industrial and agricultural production, will also increase shipments through Georgia’s ports. The main headwind will be the strong U.S. dollar, which will be a problem for exports but will continue to spur imports. Increased competition from ports in Mexico and Canada is unlikely to have a large impact on the state’s ports but will temper growth of overall port traffic for the nation as a whole. Staffing and temp agencies should do well as the modest pace of economic growth encourages firms to remain flexible. Since the recession, more companies favor temporary workers over permanent hires. Demand for staffing services tends to lead growth in permanent hires. The state’s low unemployment rate will restrain growth of the staffing industry in two ways, however. First, workers will be less willing to accept temporary positions since permanent jobs are available. Second, the supply of suitable temporary workers will be lower. The staffing industry will also benefit from its increased focus on professional and technical workers, employee turnover increases and the fact that many of Georgia’s largest companies, which historically rely the most on these agencies, are performing well. The abundance of economic development projects in the pipeline also bodes well. The outlook for consulting firms is positive, since business and governmental operations and decisions are increasingly complex and maintaining a range of in-house experts is expensive. The continuing economic expansion, growth in corporate profits, more expansions and relocations, and higher revenue collections by local and state governments will bring prosperity to many consulting firms. Opportunities for domestic consulting will be better than for international consulting, but revenue from both activities will grow. One problem is that more clients are suing for malpractice when things go wrong. Lawyers and law firms should do well in 2018 thanks to cyclical increases in demand for legal services, the ongoing recovery of housing and nonresidential construction, and the growth of disposable personal income and the number of jobs. Law firms that service businesses will benefit from increases in the number of startups, expansions, and mergers and acquisitions. Businesses also typically devote more resources to litigation when profits are on the upswing. Larger firms will find the best opportunities in Metro Atlanta, but independent lawyers will fare best in expanding small- or medium-sized communities. National firms will continue to grow in Atlanta thanks to its strong potential client base and the ease of using Atlanta as a hub to service clients throughout the Southeast. The growing number of high-income retirees will benefit lawyers that specialize in planning estates and drafting wills. Despite better preventive care, demand for dental services will continue to grow as standards of acceptable dental care and beauty continue to rise. The aging of restorative work performed on baby boomers will also contribute to demand. Higher incomes and more dental plans will allow consumers to invest more in preventive and cosmetic procedures. As the economy generates new jobs and parents move from part-time to full-time positions, more will rely on child care providers. Providers should be able to raise rates at a pace that covers cost increases but probably will not enlarge net margins much. The industry will prosper as more children are enrolled in professional daycare thanks to high labor force participation rates for women and more single-parent and nontraditional households. Also, the proportion of families where one spouse is not working that purchases child care services will expand. The trend toward delayed childbearing in order to establish careers and incomes will also help the child care industry, particularly the high-priced luxury end of the industry. Parents’ increased desire to control what school-aged children do after school also favors child care firms that specialize in after-school care. Retail sales in Georgia will rise by more than 5 percent, exceeding the gain expected for U.S. retail sales. The primary drivers will be job, income and population growth; stronger housing markets; a higher rate of household formation; and increasing consumer confidence. Headwinds will include the ongoing shift of consumer spending from goods to services, the aging population, the unevenness of the home-price recovery and a pervasive lack of pricing power due to intense competition between traditional and online retailers. On balance, Georgia retailers will see top-line growth but narrowing margins. Many brick-and-mortar stores will close, and the number of retail jobs will decline. Low-end and high-end retailers will fare better than mid-market ones. Retailers that fully integrate online and physical stores will fare better than those that do not; the ones who face the most intense digital competition have the worst prospects. The strongest malls will do well, but the majority will underperform. Due primarily to competition from digi- tal media, Georgia’s printing industry will remain in decline, though the rate of decline probably will decelerate. 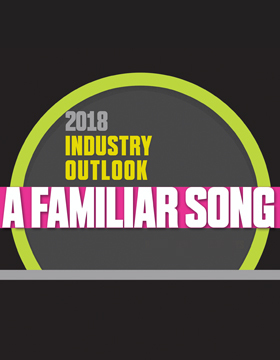 Cyclical increases in commercial advertising will be a tailwind for the industry, but an increasing share of the advertising dollar will be digital rather than printed. Slowly rising levels of office-based employment and a limited uptick in new business formation also will increase demand for printed materials. Increased revenue collections by local government will cause public schools and libraries to increase their outlays for printed materials. Hospitality will continue to outperform Georgia’s overall economy, with higher demand for both limited-service properties that cater primarily to tourists and full-service properties that are popular with business travelers posting significant gains. The long stretch of impressive performance has stimulated new development in many areas of the state. The number of new hotel rooms will slightly exceed demand growth, causing revenue per available room to grow more slowly – but faster than the GDP. The shared economy is a major disruptor for the lodging industry, with advantages for home-sharing companies including less regulation and lower overhead. The promise of lower prices and the possibility of a more authentic experience attract travelers to platforms such as Airbnb, HomeAway and TripAdvisor Vacation Rentals. The outlook for the restaurant industry calls for the ninth-straight year of sales growth. Quick-service sales growth will outpace table-service sales growth, with fast-casual restaurants faring especially well. Bars and taverns will see very slow growth whereas cafeterias and buffets will see decline. Home delivery, food trucks and street food will increase in popularity. Supporting factors include population, employment and personal income growth; relatively low gas prices; busier households; more business activity; and more travel and tourism. The lower unemployment rate, strict enforcement of immigration laws and greater availability of higher-paid jobs in other economic sectors will make finding and keeping qualified and motivated employees more difficult.